This story is part of another one of my favorite memories from my youth. The back story: My Grandmother bought me a set of drums for my birthday when I was about 13-14. 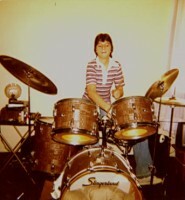 It was a sweet kit for the mid 70’s and I played it for hours on end. I guess it was 76 or 77 and my two favorite 8-tracks (yes 8-tracks) were Frampton Comes Alive and The Beach Boys Endless Summer. In fact they are still great to listen to. I had the good fortune to meet Peter Frampton in the early 90’s and got to tell him what that album meant to me as a kid. I’m sure he had heard that about a million times but he genuinely seemed happy to hear it. Anyway, back to the story. On the night of the day that I got my drum kit there was a terrible accident in front of our house around about 1AM. It was a scene straight out of those Driver’s Ed movies. A car load of young Marines were speeding down Claybrook and ran the stop sign. At the exact wrong moment a police cruiser was heading to a call down Jefferson and of course they collided. It sounded like my entire kit had fallen down and I was sure my Mom was going to be upset at the racket that caused (my room was upstairs at that time and her’s was down). By the time I got up and realized that my drums were right where I left them I then heard the off key siren and saw the loopy blue light through the window shades. As I got downstairs my Mom was heading out the front door. She looked outside and ran back to call the police and ambulance (way before 911). We both went out at the same time, although she didn’t want me to go because she was afraid of what we were going to see. The police cruiser was half way in our yard and had missed the light pole by about 6 inches. The car the Marines were in was about 50 yards away. We found out later that the engine had been thrown almost 150 feet from the car. It got worse from there. My Mother was at that time a bank teller at United American Bank at Jefferson and 2nd Street. A good number of policemen came in her bank from time to time and after she walked to the patrol car she realized she knew the officer who was driving. He was in pretty bad shape and she was a quite shaken up by the whole thing. She stayed with him until the ambulance arrived. Among the hundreds of other things I admired about her was that act of compassion. The officer made a full recovery to the best of my recollection but spent weeks in the hospital. All told I believe a couple of the Marines died and everyone involved was taken to the hospital. That intersection was notorious for accidents over the years. If anyone remembers Monk, the homeless guy that used to roam midtown, he was actually hit by a car in front of our house. I believe he later died from complications of that accident, but I’m not 100% sure of that. I remember a few of our neighbors lobbying for a light at the intersection but it never happened. So back to the drums, I couldn’t end the post without a picture of them. There are many things about the picture that could be pointed out, but the two that stand out to me are the light machine/mirror ball and the 8-track player to my left. Also I believe that shirt is back in style.